MyReporter.com How did Market Street get its name? How did Market Street get its name? Believe it or not, a market house once stood in the middle of Market Street at the intersection with Front Street. “Market” is one of Wilmington’s original street names, and the market building seems to have been there almost from the beginning. It’s clearly marked on a 1769 map of the colonial town (now in the State Archives). The market house was important enough that, in 1839, the Wilmington town commissioners voted to add a second story and a belfry to the structure. This addition must have been soon outgrown, though, for in 1848, the town erected a whole new market house, stretching 187 feet down the street toward the Cape Fear River. Its cast-iron roof was upheld by 38 cast-iron columns, and a 565-pound bell in the belfry sounded the nightly 9 o’clock curfew. An 1855 drawing of the town — reproduced in “Ballou’s Pictorial Drawing-Room Companion” — as well as surviving photos suggest that it resembled a smaller version of the market house that survives to this day in Charleston, S.C. Although most slave auctions in Wilmington took place at the New Hanover County courthouse, at least a few slaves were sold there — and, more important, slaves who worked under contract for employers other than their owners would renew their year-long leases at the market house soon after New Year’s Day each year. Rufus Bunnell, a draftsman from New England who worked on the construction of Wilmington’s Bellamy Mansion, noted in his diary for Jan. 2, 1860 that “Hundreds of (N)egro slaves huddled about the Market House … sitting or standing in the keen weather” to renew their contracts. (He probably meant “keen” in the older sense of “intense,” rather than “nice.”) These contract slaves were often skilled laborers, especially in the construction trades — the workers who helped build Thalian Hall, the Bellamy Mansion and many of the city’s landmarks. 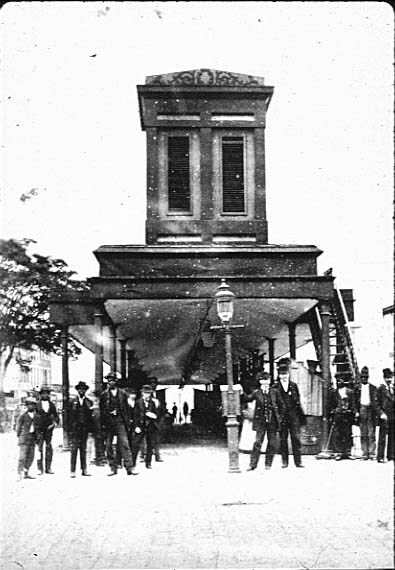 In 1878, the city had gaslights installed in the market house. Just two years later, though, the city fathers decided the old building was no longer needed and on Jan. 27, 1881, the structure was demolished. Ironically (given its connections to slavery), the contract to tear down the market house went to Alfred Augustus Howe, an African-American builder and former Wilmington alderman. Howe paid $150 for the salvaged ironwork from the structure. Market Street near the river was Wilmington’s commercial center until well into the 1900s. The town docks were located at the foot of Market in the 1700s, and the steamer Wilmington, which cruised the Cape Fear River after the Civil War, used to tie up there. North-south streets in the city are numbered from Market Street.